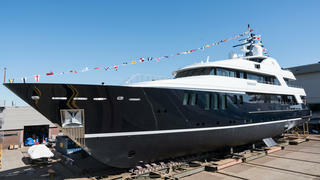 The 44.9 metre Abeking & Rasmussen yacht Bravado has been relaunched after an extensive refit at Balk Shipyard. Work began in November 2015 at the Urk facility in the Netherlands and the refitted superyacht emerged from the shed earlier this month. Significant alterations include the exterior colour scheme, which was changed from the original white to a tri-tone design of white, majestic blue and shark grey. 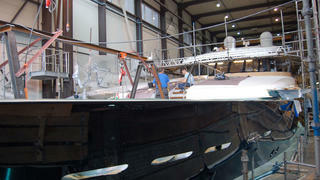 The sundeck was also expanded to increase the sunbathing area, and new sliding glass doors fitted to the aft deck. The interior has also been given a complete makeover, with 200 square metres of Burmese teak and pale grey wall linings replacing the traditional mahogany woodwork. The general arrangement remains unchanged, with accommodation for 12 guests including an aft-facing owner’s cabin with its own gym. The original twin 1,085hp MTU engines are still in place, but they have been given a zero-hour overhaul. Bravado's owner has also ordered a new 11.58 metre custom tender from Wajer & Wajer that has been styled to match the mothership. Upgraded water toys on-board include a Jet Ski and a flyboard. Following the refit, the owner plans to take Bravado on a round-the-world tour, taking in the northwest passage, with captain Mark O’Connell at the helm.